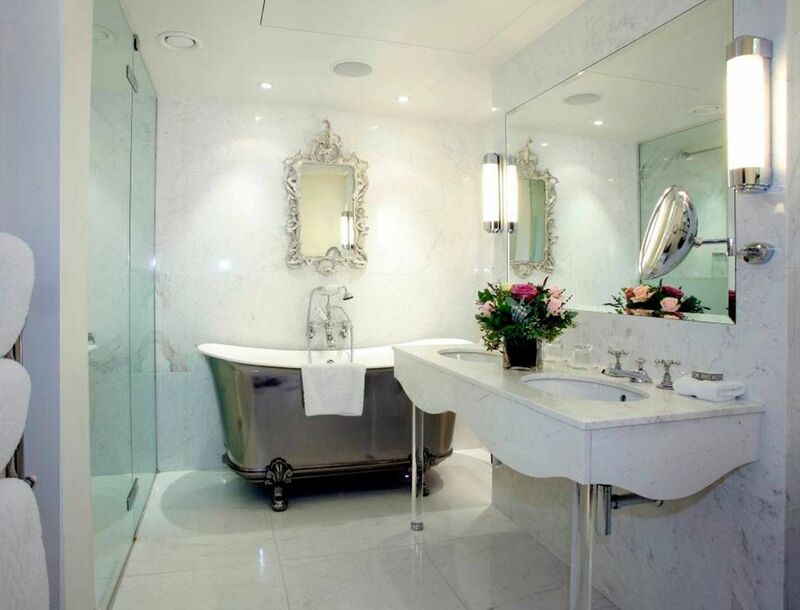 So what are the characteristics of luxury bathrooms today? One of the main features of luxury bathrooms are available amenities such as lusciously soft towels, high-quality bath rugs and a generous supply of high end quality products. The most outstanding feature all luxury bathrooms have in common is their flair of solidity and quality. This is primarily reflected by the building materials used such as marble, granite and luxurious quartz crystal floor tiles. Displaying luxurious beauty products such as Kiel soap and lotions from Bronnley, Yardley or Molton Brown that have royal warrants of appointment will clearly be associated with lavish style. A well-thought-out design is a further hallmark of high-quality bathrooms. A luxurious flair is the end-result of a stylistically harmonious room with good alignment which can be seen as soon as one enters the room, especially when the bathroom furniture has been carefully selected to establish an elegant atmosphere. In the bathroom of the Royal Suite of the quintessentially royal luxury hotel The Goring, where the Duchess of Cambridge spent the night on the eve of her wedding, a portrait of Queen Victoria hangs behind a glass wall –inside the shower. Alongside such opulence, the artistic arrangement of beams and cornices enrich large bathrooms. These stylistic devices cleverly affect the eyes, as they stimulate multi-layered perspectives, embellishing the bathroom with depth and a multidimensional quality. When one sees antique bath tubs in Roman gardens or in old mansions, the design of freestanding tubs hasn´t changed in essentials. The shape of the freestanding bathtub has been maintained for hundreds of years, because it is a classic shape whose dimensions serve the same purpose today as in times past. 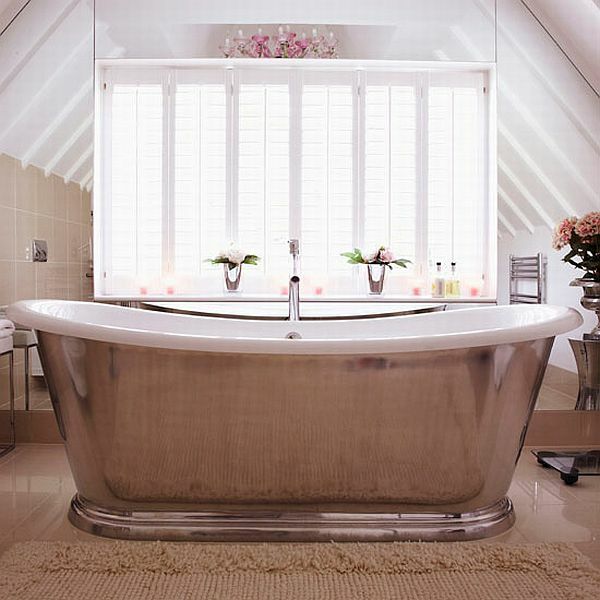 Antique and contemporary free standing bath tubs are characteristically oval and decorative and can therefore be positioned in the centre of a bathroom – almost like a sculpture to be shown off to its best advantage. Ornamental free standing baths deserve to be put centre stage in the heart of a luxurious bathroom. Many of these are adorned with an eye-catching plinth, which conveniently also hides unsightly pipework. In ancient Rome artistic mosaics embellished the floors of Roman baths. In modern times we decorate and improve our luxury bathrooms with floor lights, floor heating and underfloor LED lighting. This is, after all, a very pleasant warmth, because you can feel the warmth directly underfoot. An added advantage of illuminated floors is that the senses are more subtly engaged by light that shines from below. In ancient Rome the floors were heated with the hypocaust, an ancient Roman floor heating system. This Roman heating system was a large heater through which hot air was funnelled. With this heating system the ancient Romans were able heat their baths as well as large seating benches and walls. Today radiant heat is used, which is installed into the floors and walls internally behind floor-to-ceiling wall panels and allows for the bathroom to look more chic and clear-cut while providing even and dust-free heat. A luxurious ambiance can be achieved through a well-designed room that is inviting. In antiquity mural art and aesthetic sculptures were used to create an interesting and entertaining ambiance for visitors. This isn´t so different today, although modern technology enables us to install invisible in-wall speakers, CD-players, televisions and server systems storing and streaming video and audio content to televisions around the house and into bathrooms; these can even be integrated into mirrors to enhance the feeling of luxury. Other methods of creating a comfortable and practical ambiance are utilizing wall alcoves, sunken bathtubs and shower seat niches. Luxury bathrooms are usually spacious enough to accommodate more cumbersome luxury furniture, too. A beautiful divan is just the ticket for a spacious luxury bathroom. In the past oil lamps, candles and torches were used for lighting. Since the 19th century we have electric light and since 1962 we even have colored LED light, which is often used in modern luxury designer bathrooms for accentuating floor tiles, flowing water and fluorescence in showers. Innovative light can instantly spark a feeling of luxury; this is why it is strategically placed in the room as another feature of the luxury bathroom. To cater to all senses, scent is often used in luxury bathrooms in order to create a pampering atmosphere and mood. Essential oils were a particularly luxurious commodity in the middle ages in Europe, because these were rare and expensive goods. Sculptures, stained glass windows and artistically ingenious architectural techniques, mosaics, frescoes, plastering and columns are still being used today to beautify luxurious bathrooms. 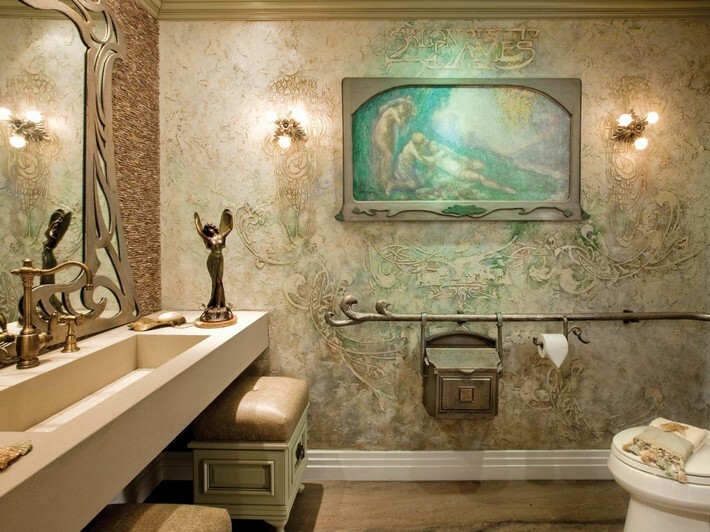 One wonders why antique objects of art and classical architectural techniques are still being used for luxury bathrooms today. The reason is that ionic, Corinthian and Doric columns, sculptures, etc. are still regarded as timeless, decorative and luxurious and the reason why this hasn´t changed lies in the fact that our association of harmony and beauty also known as the golden ratio or golden section is reflected in these harmonious pieces of art.